I get to Seattle on a fairly regular basis. If I have an afternoon free, I love to go Mattâ€™s at the Market for lunch and then walk over the Virginia for a few beers. This is a small tavern with some decent beer offerings and a nice little terrace in the front. If you can get one of the two tables furthest from the door, you are blessed with a nice view of the water and can watch people huff up the steep little hill. One quirk is the bar stools are fastened to the floor. Did they have a rash of thefts, is it a safety device so you donâ€™t knock one over or do they do it for some other reason? I like small mysteries. Iâ€™ve always had good service here. Itâ€™s quick but not hovering, professional more than overly friendly. I like it. They offer about 8 to 10 decent draft choices. While not a huge selection, it seems to well thought out and always has something I havenâ€™t tried before. Worth a stop if you in the neighborhood. The Virginia Inn has a good microbrew selection (quite good for downtown) and very good food. 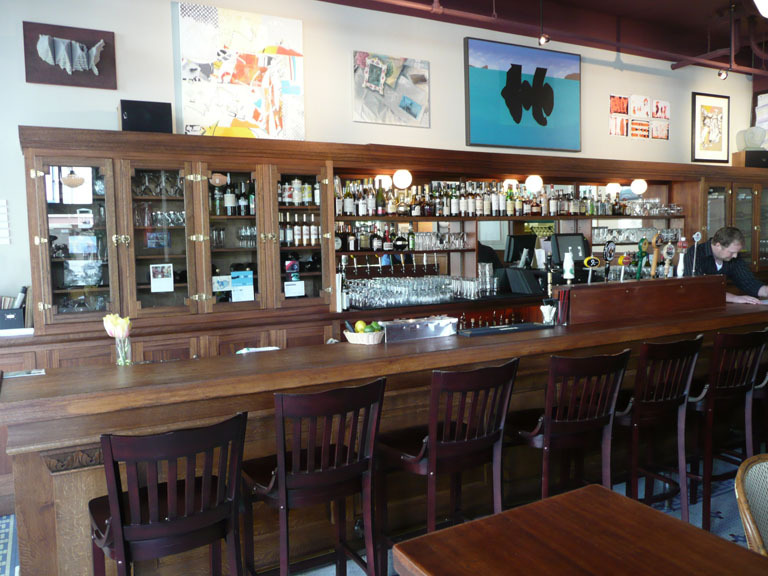 Itâ€™s in an old historic building, just one block inland/uphill from the Pike Place Market. They just recently doubled their size by expanding into the space next door. That gave them room for a real kitchen in contrast with the tiny facility they had before. 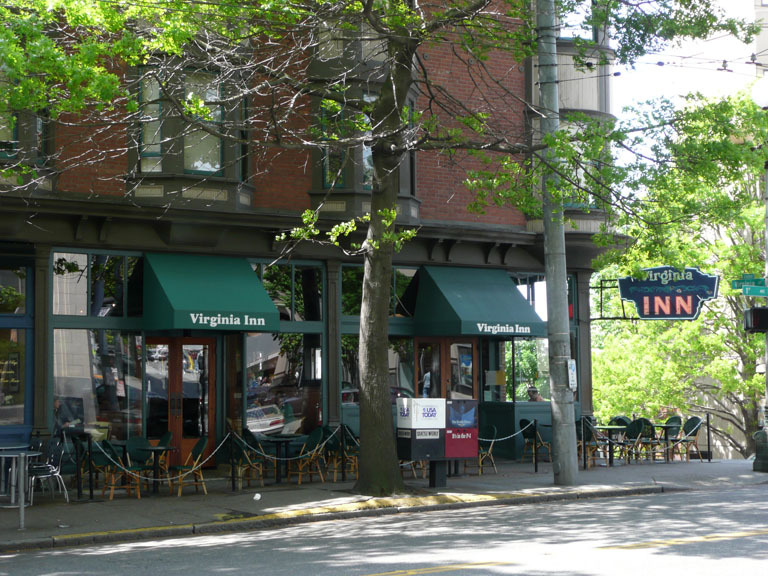 The Virginia Inn is a pleasant space, right in the city. 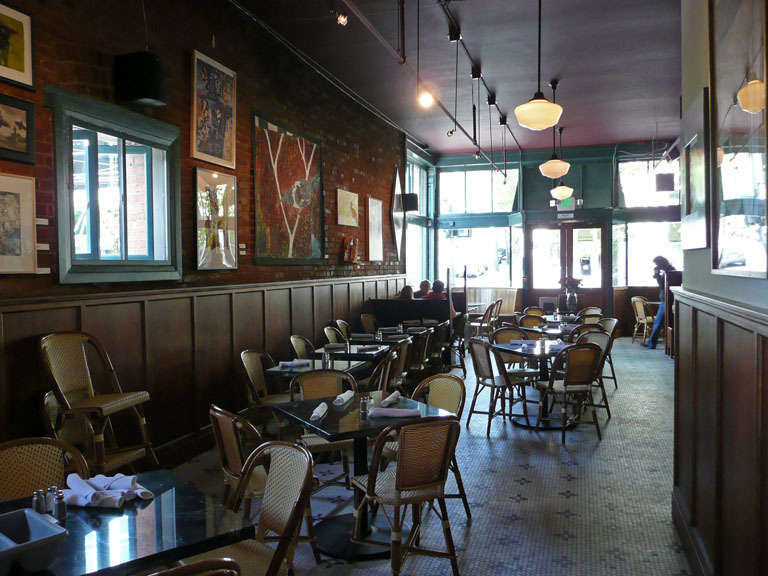 It has brick walls, marble tables (and some wooden booths), and a classic old hexagonal tile pattern on the floors. There are no TVs and paintings (for sale) decorate the walls. Large front windows looking out on outdoor tables under broad shady oak trees on the street add a lot to the atmosphere. The pints do seem a bit undersized and on the higher end of local prices, so we have to call it a pricey, but this is still a great place to visit and really one of the few places to get good beer downtown. The food is excellent. Itâ€™s French-influenced Northwest cuisine and youâ€™ll find quiche, great salads, sandwiches, cheese plates, etc.